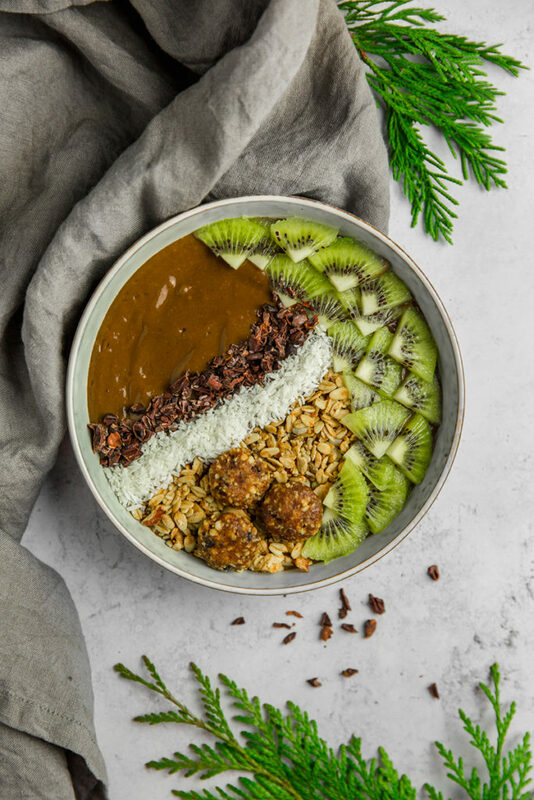 This chocolatey smoothie bowl is so creamy and comforting that you can eat even during cold winter. It is loaded with fruits, veggies and superfoods for a nourishing healthy breakfast. During my last trip in Bali, smoothie bowls were my regular breakfast. I love to start my day with a healthy, light but nourishing bowl of fresh fruits and greens. Particularly in Bali where I can have access to local and seasonal tropical fruit, I didn’t want to miss this opportunity. 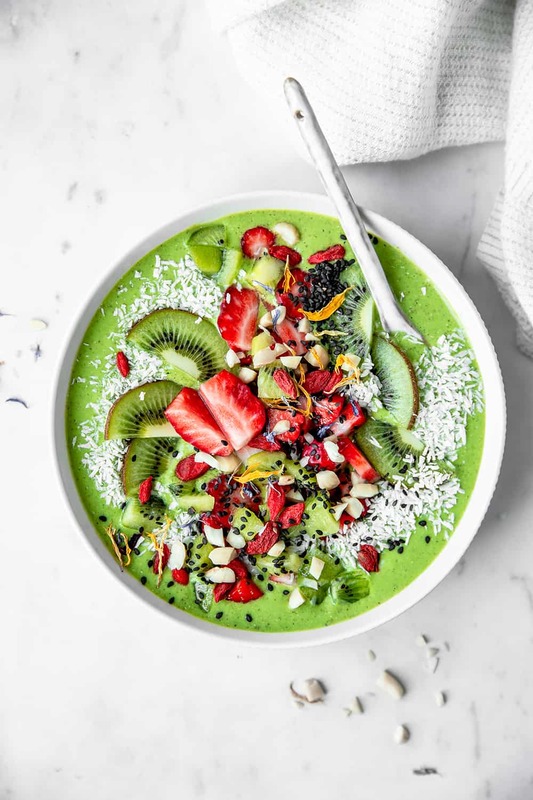 Be it in a café or at home with my blender, I had a smoothie bowl every morning. It is so delicious and keeps me full and energized for hours. 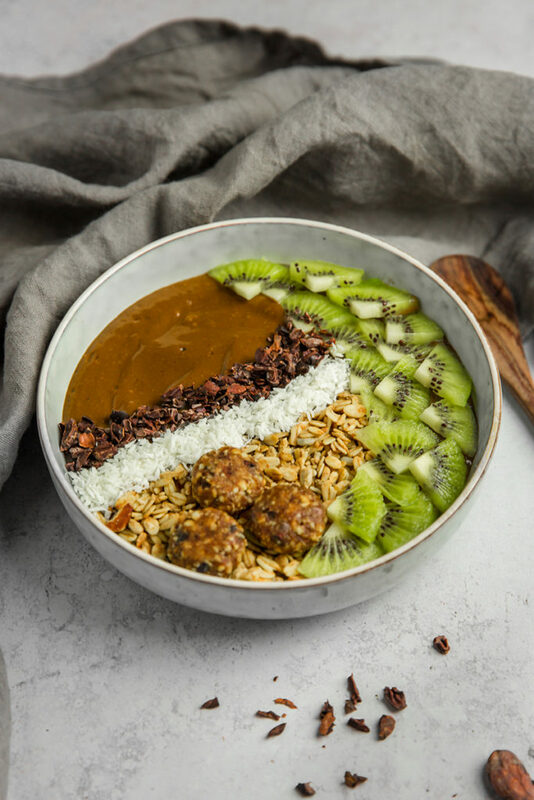 I love how they are versatile, either you want something fresh and fruity or something nourishing, there is always a smoothie bowl for any occasion! But last week, when back home in Paris, I had to face the reality of a freezing winter with cold and dark mornings that make you want to stay under my duvet. Usually in these conditions, everything I want for breakfast is a warm bowl of oatmeal or granola and peanut butter! But I can’t resolve to say goodbye to my smoothies. So I had to find a solution ! 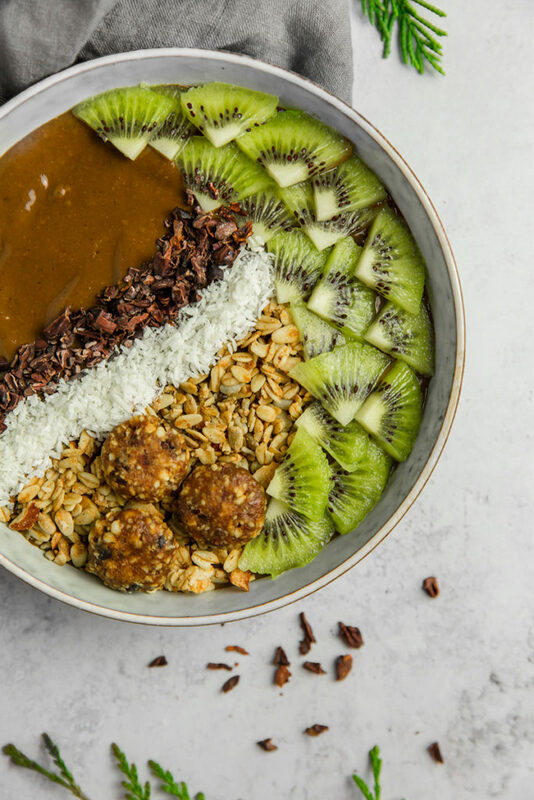 And why not to make a winter smoothie bowl? An indulgent smoothie that you an enjoy even when it’s cold? Usually I use as much frozen fruits as possible in my smoothies to give them this thick and creamy consistency. But during winter, I think nobody want a frozen breakfast in the morning! So I have swapped the frozen fruits by fresh fruits and added an extra ground flaxseeds to thicken the smoothie. Flax seeds just like chia seeds are amazing thickeners! When mix with other ingredients, they will absorb the liquid and make the mixture thicker. Also, they are superfoods loaded with good nutrients, like fibers, omega-3 fatty acids, proteins and all that in very few calories. I love to use them in my smoothies but also as toppings. To make my smoothies even more healthy and nourishing, I love to add some greens, like zucchini, kale, cauliflower or here baby spinach. It is a great way to add more veggies into your diet without even feeling it! I can promise you won’t even taste the veggies that will be hidden by the fruits and other ingredients. And if you are not yet totally comfortable with adding whole greens in your smoothies you can start using some natural greens powders. To finish this smoothie, a couple of teaspoons of cacao powder and a touch of cinnamon bring this comforting indulgent touch. Contrary to popular thinking, good quality cacao powder is a very good ingredient. It is a powerful antioxydant full of iron, magnesium and calcium. But make sure you buy unsweetened and preferably raw cacao powder to have all the nutrients! 1. Put the banana, mango, baby spinach leaves and almond milk in a food processor or high speed blender and blend until smooth. 2. Add the ground flaxseeds, cacao powder and cinnamon and blend again until completely smooth. 3. 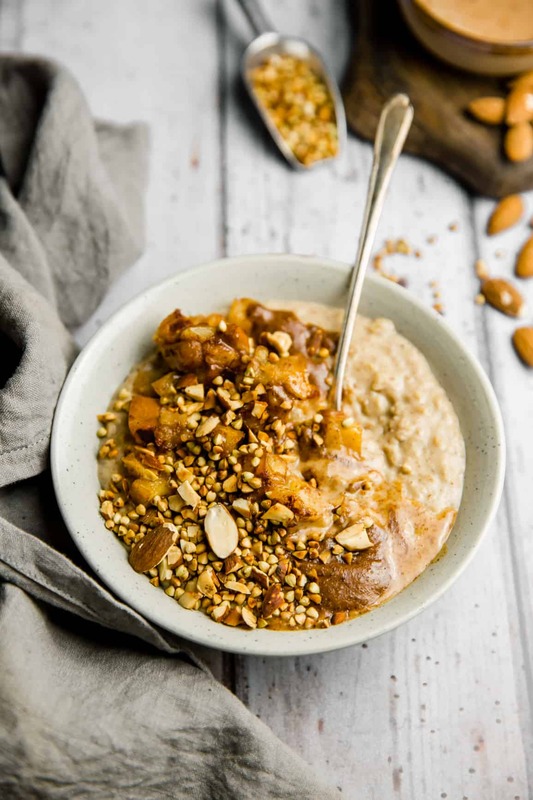 Transfer the mixture in your serving bowl and let stand at room temperature for 5 minutes: the ground flaxseeds will start to act as a thicker for a dreamy creamy texture. 4. 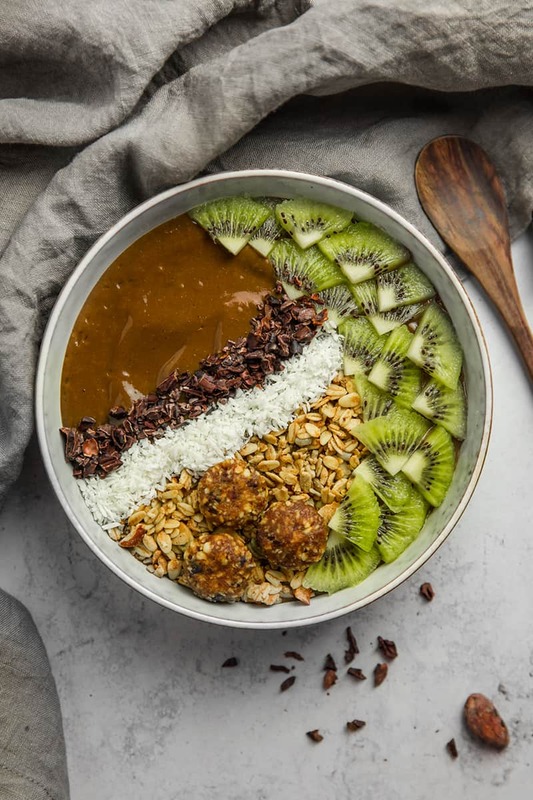 Top with fresh seasonal fruits, granola, shredded coconut, cacao nibs or any other of your favorite toppings. Enjoy! You can sub the ground flaxseeds for ground chia seeds which also act as a thickener. Add a tablespoon of maple syrup or agave in step 2. for an extra sweetness. 1. 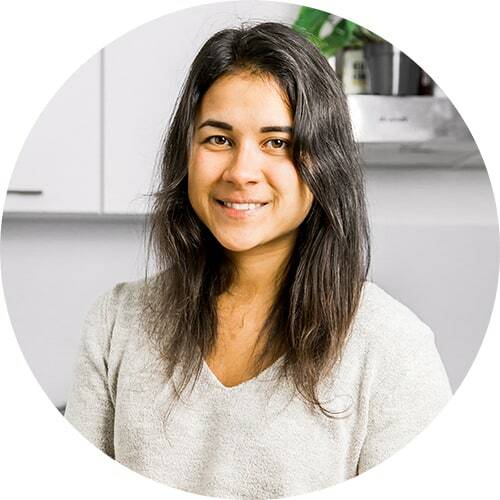 Placer la banane, la mangue, les pousses d’épinard et le lait d’amande dans un mixeur ou un blender, et mixer jusqu’à obtenir un mélange bien lisse. 2. Ajouter les graines de lin moulues, la poudre de cacao et la cannelle et mixer de nouveau jusqu’à ce que le mélange soit parfaitement lisse et onctueux. 3. Verser la préparation dans un bol et laisser reposer 5 minutes à température ambiante : les grains de lin vont agir comme un épaississant pour une texture ultra crémeuse. 4. Agrémenter le smoothie de fruits de saison, de granola, de noix de coco râpée, d’éclats de cacao ou n’importe quel autre topping de votre choix! Les graines de lins moulues peuvent être substituées par des graines de chia moulues. Pour un smoothie plus sucré, ajouter une cuillère à soupe de sirop d’érable ou d’agave à l’étape 2.